I bought some antique bronze filament from blackmagic3d on Amazon.. originally I intended to print a bust of Teddy Roosevelt for my aunt. 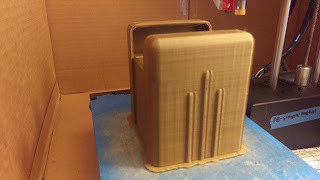 however my first attempt of printing another project (my cursed deck box) waste 30% of my .5kg roll. Of course I had to try reprinting it today because I want a bronze/gold deck box! so along with the successful(!!!!) print and the lid for that box, I've used .4kg. I an not sure I'll have enough for Teddy. I would like a matching life counter, so I guess I will see how much filament Teddy will take up and if it's less than 100g I'll move forward. or else I'll print the life counter. Wouldn't that be so neat to have a life counter to match my deck box? 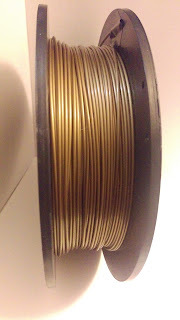 When I opened it, I was a little underwhelmed, but I liked this filament the second it started printing. I really enjoyed watching layer upon layer going down. I was worried it would look bad or blotchy, but just like the PLA I used in the past, this has gone down even and beautifully. 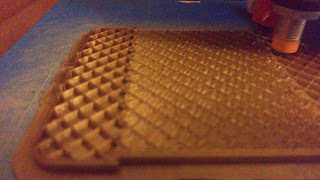 The low percentage of infill I used caused a cool shadowwy ghosting of the details on my deck box. 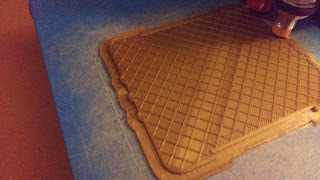 I wish there was a way to melt down and recycle my unused of wasted plastic so I could make more prints. I would love to buy another roll and print stuff that should be gold/bronze! 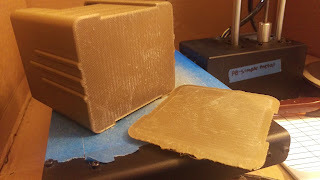 I am not sure if it is this specific PLA or happenstance, but i had the cleanest separation of raft from object so far - I may have evened out my attack method on it, but it could also be the PLA itself. I recommend giving it a try if you have $20 and 500g of prints that need to be bronze!